DisneyWorld Kir Royale Anyone? We Have The Secret Ingredient! If you have been to Epcot and enjoyed the Kir Royale, you probably forgot to ask for the recipe. Lucky for you I didn’t. The funny thing is that during the food and wine festival this year I noticed they were pouring something different. Instead of the standard Champagne and Cassis from Montbisou, they were pouring the same stuff the cheap placed pour. Just to make it easier to shop for this stuff, I am posting a picture here on BeachStreetNews.com. I forget what this stuff is when I go shopping and it is really embarrassing to be standing there with a bottle of champagne, headed out to a celebration and saying to my self “What goes in a Kir Royale again?”. Mostly because my inner voice escapes and people wonder why I am talking to a champagne bottle. While I normally like Champagne, adding a dash or two of cassis takes out the bite. Not being one to fool with success, I wanted only the same Cassis that we enjoyed the first time we were at Disney’s Epcot Center. Like many drinks I try on the road, this one baffled us for a while. Each store had their own recipe and I found several different Kir Royale blends online. Many of the recipe’s are raspberry instead of Cassis which is black currant liquor. The cheaper versions are called Creme de Cassis, so I am guessing sugar and black currant flavor? The more I looked around the more I learned about adult beverages with cassis. Kir is a wine cocktail, and the Kir Royale is simply champagne version. There is an entire list of drinks to use Cassis in on Food and Wine’s website. One recipe I found used Chambord, which sounded good, but I wanted to make sure I had not only the correct Kir Royale to take to my Disney fan friends party, but the best one. 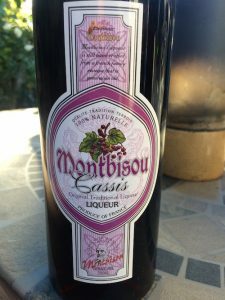 As far as I can tell Montbisou Cassis from France makes the best Kir Royale, but then again it is the only Kir Royale I have ever had so if you have a suggestion, please feel free to share it. If you are looking for a good wine, all of my favorites are saved in the Wine Section to help both of us find a good wine quickly when the wine buyer isn’t around to tell us were the deals are. Maybe we’ll get lucky and Paul Zahn over at Tipsy Television will do an episode on Kir Royale.